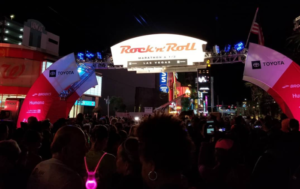 Total bucket list race: Rock N Roll Las Vegas! I mean, who wouldn’t want the chance to run the only private event to shut down the strip! The corral system they have for the race is a bit of a mess – they have colored bibs with corrals within each color. But, they didn’t really mean anything. Once you were called into the corral by your bib color, it was a free-for-all. There was no way to get into your number corral because they basically just herded everyone into the start line area. I understand that there are 40,000 people that run the race but there has to be a better solution for this. I spent the rest of the race fighting and weaving in between walkers. Some that would walk 5-6 people across. By the time I started, Erica Bushu was probably more than 1/2 the way done and I received notification that Laila Maly had already finished the 10K before I even started. Bonus was that Laila and her husband were along the course to cheer and give me a big hug along the way! 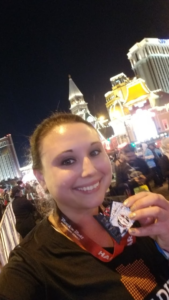 Overall, it was a neat experience to run down the strip with no cars. I got to see parts of Vegas that I had never seen, including the famous Welcome to Las Vegas sign. The streets were a bit dark but for the most part, they tried to keep them well lit. 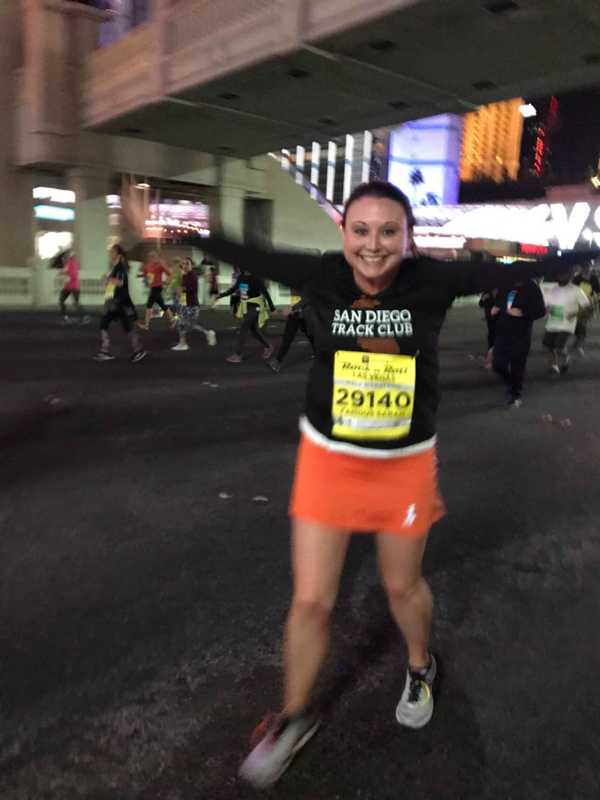 I only tripped once and was able to keep my clean record of never falling in a race! (haha!) 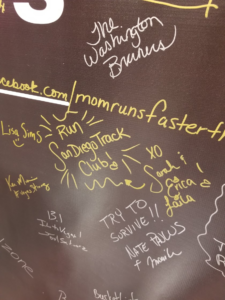 I met people from all over the country and it was so much fun to tell them about my hometown where we get to run races all year long and the community of runners that we have. It was inspiring to meet runners from all over the country and to share my love of SDTC! If I were to go back to run this race, I would only run the 10K. 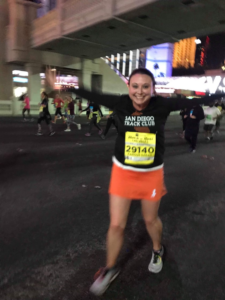 Less guilt of partying in Vegas before the race plus less frustration of fighting “tourists”. But lifetime memories were made with my friends that I would not trade for anything!